What is A Good Trombone Mouthpiece Size for a Trombone Student? "What is A Good Trombone Mouthpiece Size for a Student?" The Bach 6 ½ AL is one of the best trombone mouthpiece sizes for students. It is a good, medium-deep size mouthpiece that will continue to be the right size for many students as they get older. Some students will need to move to a larger mouthpiece by high school, such as a Bach 5G, but many will not. The Bach 12C is a popular student mouthpiece size. It is on the small side, and many students will soon need to move to a larger size like the 6 ½ AL. A few students will do better on the 12C, but most will do as well or better starting on the 6 ½ AL. 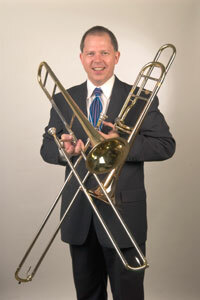 Larger is not always best, however, so if a student sounds great on a 12C, let them play it – especially if they stay on a small bore trombone. Not all students will need something bigger as they get older. If you need a size in between, the Bach 7C is a good choice. These are not "student" mouthpieces, they are good sizes for students. Many professional players use these same mouthpieces.